I like to think that I'm pretty good at picking gifts for my loved ones, even the ones that seem to have it all like my sister ;) With all the holiday markets happening since November, I had the chance to discover some of the newest local products here in Montreal. I'm super happy to share 7 gift ideas that also happen to be genderless. Let me know if you knew about them before reading this in the comments below! This new micro-roaster really caught my eye with its beautiful branding. I tried the different coffee blends and fell in love with the one seen in the photo. What sets 94 Celsius apart from other local roasters is the Cascara herbal tea blend, made from dried skins from coffee cherries. It's naturally sweet with aromas of honey and has a small dose of caffeine even though it's not officially a tea. You can find both products in the online store here or I suggest you try to catch Marc-Alexandre at a future market while they're still happening. You might even get a deal on both products at once like I did! Alvéole is such a beautiful project that started in Montreal. They have beehives all over town and have countless partnerships with schools, businesses and organizations. You can even shop all the products needed to set up your own colony! They sell awesome honey tasting box with 4 jars from different neighbourhoods in either Montreal, Toronto or Québec. The difference in colour and taste is amazing. This year, I decided to purchase their Peppermint, Chocolate & Honey Soap which smells lovely and is made with their own beeswax & honey. Banghosi is yet another new company! It imports high-quality matcha straight from Uji, near Kyoto in Japan. I was pleased to confirm that Léonie had visited this region and picked this matcha herself after trying several types. I tasted it simply mixed with hot water and it was rich & satisfying. I had been meaning to get a kit for a while especially for the whisk so it was the perfect opportunity! 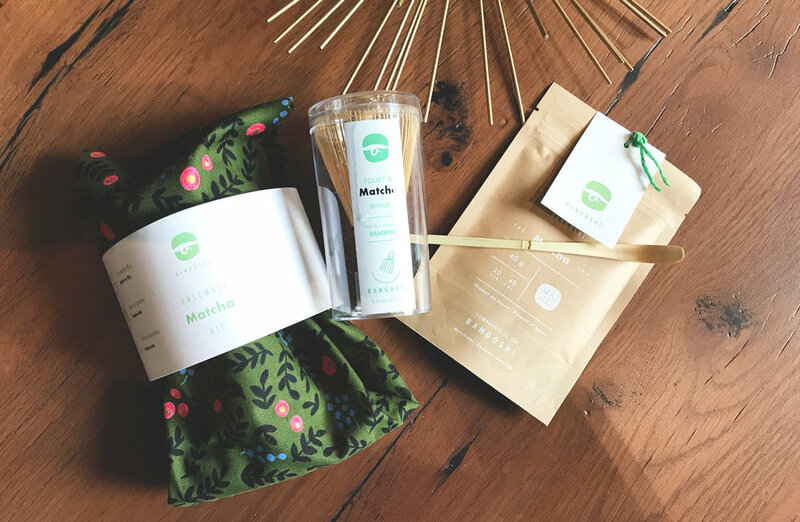 Check out her online store or try to catch her at an upcoming market to get your hands on the matcha or a kit wrapped in a reusable packaging. Cacao 70 is a fun and decadent Canadian chain that started right here in Montreal. What you might not know is that we now have our own bean-to-bar factory in Pointe-Saint-Charles. Gaiia already won 3 awards at the International Chocolate Awards after submitting six infused chocolate bars including the one pictured above. I think it's worth going for a visit to pick up a few winners and match it with product favourites served at the chain like the Sesame Hot Chocolate! I love anything that's reusable especially if the design is beautiful and that's exactly what Dans le sac offers. From reusable bread bags to cotton/hemp napkins, they've got you covered to make a real change. I particularly like their baguette bag which fits 2 baguettes and has a strap that can be worn. It's the perfect bag to store bread for a weekend getaway! Dinette Magazine just celebrated its second anniversary. This magazine focuses on local creators and the art of living, indoors & outdoors altogether. Offering a membership [6 months / 1 magazine per month] is the perfect gift idea for someone who's passionate about design, home cooking and just lifestyle in general. To make it even sweeter, you can combine it with a few treats from Juliette & Chocolat who is featured in the latest issue! I have been personally feeling pretty bad about the number of pads I throw away weekly since I've become obsessed with toners and these pads have become my saviours! It's such an easy yet thoughtful gift and I strongly believe you can't go wrong with something that you won't have to purchase ever again (or for a long time at least). That's it for this year. I really do hope this list inspires you either as gift ideas for people around you or even yourself!